Rewind to almost ten years ago, and I was simultaneously enamored and disenchanted with living in South Korea. What does South Korea have to do with entomophagy (eating insects), you ask? Well, being a pretty naive girl from Six Lakes, Michigan, I was shocked and disgusted every time I observed the locals noshing on something called beondegi (번데기). While I found beondegi repulsive then, a seed was planted. Fast forward to now, ten years later, and I’ve come to the conclusion that the locals had it right: insect noshing isn’t something to be repulsed by, it’s something to be embraced! Consider the current state of global affairs and you’ll probably agree that we’re confronted with a lot of very real problems: food and water shortages, hunger, land scarcity, global warming, rising human populations, unsustainable means of food production, lack of access to resources, poverty, etc. These problems aren’t going away and, believe it or not, there IS a reasonable solution. 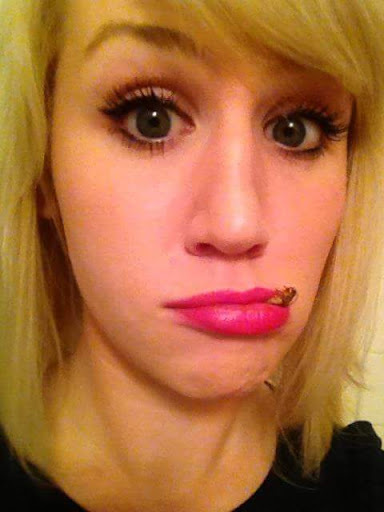 Good job, you guessed it: eating insects! While the idea of insects as a food source may be something newer–and hard to digest, quite literally–to many of us in the Western world, it’s old hat for many people. When confronted with the idea of a harrowing future that we could actively prevent now, I came to the conclusion that eating bugs is a no-brainer. I honestly have trouble wrapping my head around people who, given this information, refuse to give it a try. 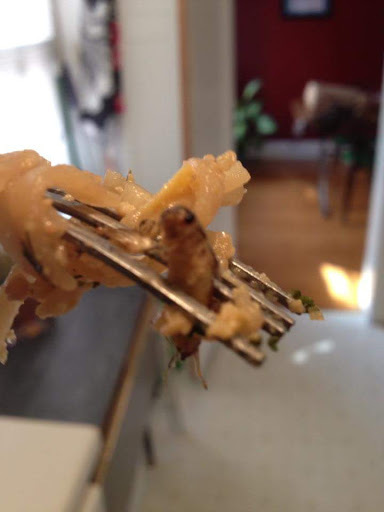 There is a growing canon of research into the numerous benefits of entomophagy. Anyone with a curious mind can read (FOR FREE! YAY!) the findings published in 2013 by the Food and Agriculture Organization of the United Nations called Edible Insects: Future Prospects for Food and Feed Security. After I finished it, I went on to read more about entomophagy by purchasing Daniella Martin’s Edible: An Adventure into the World of Eating Insects and the Last Great Hope to Save the Planet that was published just last year (2014). Good stuff there! 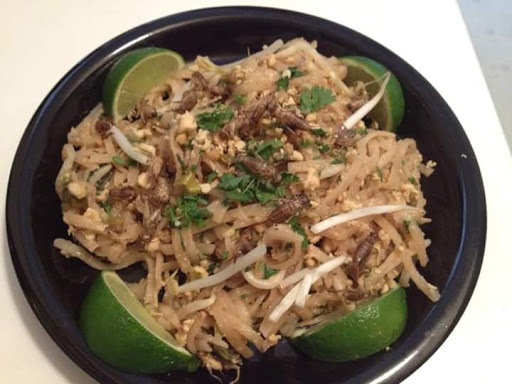 Even before reading all of this, a few years ago, I took it upon myself to try something new and made cricket pad thai and roasted crickets. They were surprisingly good (disclaimer: the look on my face was just my attempt at being cute and doesn’t do the taste justice)! My husband and my best friend tried them and, while they were apprehensive pre-chirpy morsel, they were pleasantly surprised. 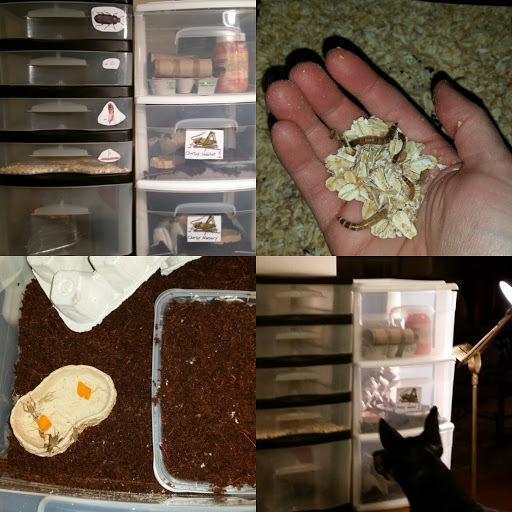 At any rate, I built (well…not really built, per se) my first mealworm and cricket farms! If you’re curious about the “construction”, I’m more than happy to fill you in. After the first week, I realized it wasn’t the best idea to put coconut fiber just about everywhere in the cricket habitat. So, I’ve now made a little “coconut fiber nest” where I can keep the fiber slightly damp so the females can lay their eggs. This also makes it much easier to remove for incubation and raising pinhead crickets in another container. Fun! While it will take a while before I’m able to harvest the little critters I’m raising, I’ll be purchasing some mealies and crickets next week so I can start experimenting with flavors. I’m excited to start cooking! Stay tuned for some great tasting, healthy, sustainable and local recipes to follow! Next Post Mealworm Frittata! BRUNCH NOMS!